What’s a bee to do when there are very few flowers available and it needs a sugar fix? Wild bees may be responding to climate change and urban expansion by relying on insects to get the sweet stuff, according to a study by Joan Meiners, a Ph.D. student at the University of Florida IFAS School of Natural Resources and Environment. 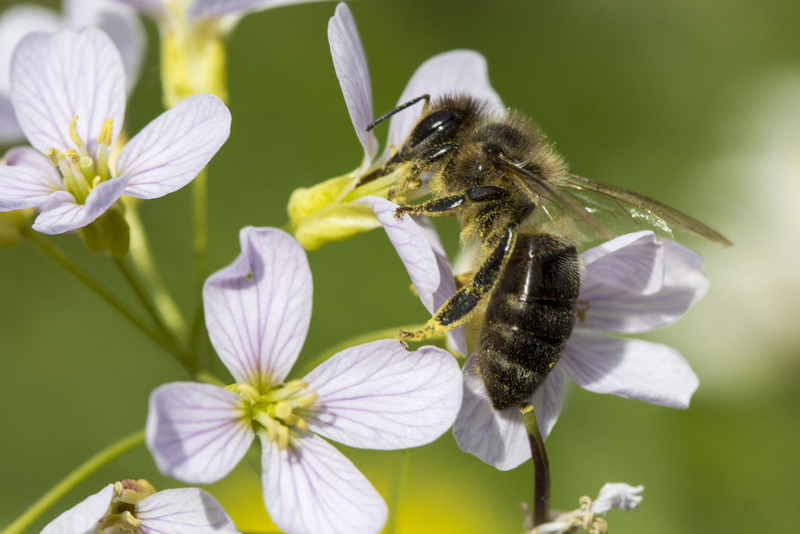 Non-honey bees, which live in holes in the ground instead of in hives, are the primary pollinators in wild habitats such as national parks and provide valuable pollination services in croplands, Meiners said. “These solitary bee species develop in the ground for about 11 months, and then come out to visit flowers for nectar and pollen—which they need for energy and to reproduce,” she said. Climate change has caused some flower species to bloom at different times than they have in the past, Meiners said. This causes a potential mismatch in bees and flowers meeting at the right time. With urban development also reducing the number of wildflower habitats, wild bees could come out of the ground to find very little food available to them. Meiners’ next study, set for spring 2018, will further explore wild bee honeydew foraging by asking: Of all the bee species present in the environments studied, which ones are using honeydew and which are not? Are there patterns or traits common to the bee species using honeydew that can help us understand how important these sugars are to them?